We are dedicated to pass on the Philosophy, the Culture and the Arts of the Samurai Sword to our students from Brazil, Portugal, Argentina, Uruguay, Chile, Mexico, Colombia and USA, in more than 50 cities around the globe. The practitioners experience 700 years of history that is maintained until today, passed on from generation to generation and brought from Japan to Brazil and to the Americas by our Sensei Jorge Kishikawa. More than 700 years of history. The Niten Institute revive the KENJUTSU old techniques and formats by applying them into combat with the help of modern trainning armor, the BOGU and put all the strategy capacity of the practicioner to the test. During the Golden Moments, when the Sensei and the Senpals gather the pupils around themselves to pass the teachings of the Japanese philosophy and culture. Sensei Jorge Kishikawa believes that constant training, purity of heart and sincerity are the fuels to the deep understanding of the Path. The KIR Method is the fundamental tool that channels the teachings of Japanese philosophy and culture into the practice and into the everyday life. Rodrigo Dangelo is the Niten Institute Coordinator in Curitiba city and Director of the Inovation Office DDID. In Sony`s TV channel `Shark Tank` show, his Office and Rodrigo himself received investiment proposals above the expected amount and also to have Robson Shiba, CEO of `China in Box` and `Gendai` food companies as a mentor and consultant. The practice with Two Swords. The Two Swords trainning (Kenjutsu Nito), begins right in the first day. Kendo and Kenjutsu in the Niten Institute -The origins, techniques and exchange with other dojo. The philosophical part of the practice. At the end of each class, Sensei and the Coordinators pass on the Samurai Code of Conduct teachings applied in the modern everyday life. SENSEI JORGE KISHIKAWA`s book was republished this year in 2 volumes. 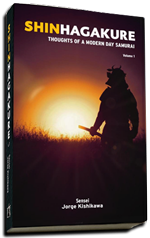 In the book, more than 300 sayings teaching us the basics of the Samurai philosophy and the KIR Method that guides the Niten Institute classes and the everyday relation between the students. Often used as reference im the Niten Institute, the Hagakure can be translated as “hidden leaves” ou “hidden by the leaves” – and is a compilation of samurai philosophy teachinga published in Setember 10th 1716, in the Nabeshima Clan House, the same region from where Sensei Jorge Kishikawa`s family and ancestors comes from. 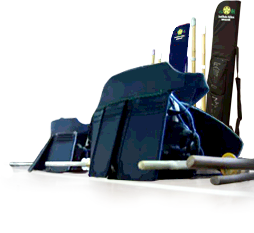 The Kobudo arts in Niten, originated in the Samurais, offer self defence techniques that were helpful and often used in the Japan feudal battlefields. The GoshinJutsu can be practiced in every class. To understand my excitement over Sensei's visit to the United States, some background is needed. My training in the way of the sword began during a study-abroad to Osaka, Japan, but even before that, I was interested in the two-sword techniques of Miyamoto Musashi. So, years later, when I discovered a branch of the Niten Institute in Buenos Aires, Argentina, I strove to become a diligent student of Kenjutsu Combat. With this in mind, it is easy to understand my excitement to hear that Sensei was planning to hold a gashuku in Miami, the first of its kind in the U.S. This was the beginning for Niten in a new country, my country, and a chance to introduce others to a culture and mentality that I respect so much. I cannot thank Sensei enough for the opportunity to assist him in this effort and look forward to helping grow the Niten Institute in America.